This one-day retreat has been designed to take time out and cherish YOU. Experience a full day of pampering and watch live skin care and make-up demonstrations that will simplify your skin care regime and transform your skin and your confidence. I have created simple and effective beauty rituals so that you can create an at home spa experience and pamper yourself. I will share all my expert beauty and wellness insider tips, and introduce a ‘modern way’ of how to perform an anti-ageing skin care and make-up regime. You will look and feel the very best you can be. + Create your very own bespoke skincare regime. + Amy will share professional tips of the most effective way to cleanse your skin and how to apply anti-ageing products such as facial serums and creams to achieve results that you can see. + Confused with all the products out there? Not sure what’s best for you? Amy will assist you to streamline your personal beauty collection. Knowledge is key and I will share with you my insight of the latest cosmetic ingredients. + Personal Skin Diagnosis. Do you know your current skin condition? You may have had oily skin as a teenager, are you still treating the same condition you were prescribed/informed ten years ago? + Achieve a radiant and natural make-up look, in three minutes. + Create your own aromatherapy pulse point elixir. + Spoil your inner goddess and create your own personal ‘at home’ spa experience. Learn easy, effective and utterly enjoyable face and body rituals. + Morning Tea + Refreshments Provided. A fun workshop has been designed for mother and daughter for managing and maintaining teen skin. Now is the time to implement a great skin health foundation, so that in years to follow, you will have the skills and be equipped with knowledge of how to maintain and achieve a gorgeous and radiant complexion. Experience a hands-on holistic approach of how to manage skin concerns such as acne, congestion, breakouts and skin sensitivity. + Experience a live make up demonstration of how to achieve a radiant glow in three minutes. + Learn how to minimise problematic skin conditions. + Experience a step by step and hands on approach of how to effectively cleanse, exfoliate and moisturise your skin. + Discover essential skin care products to include in your regime and learn about KEY ingredients to maintain a clear complexion and keep breakouts at bay. Taking time out was scheduled nowhere in my diary and I had a wake up call that my life needed to change. This is how the one-day retreats and three minute ME TIME beauty rituals came about. I understand that it is not easy for us to take time away from our busy lifestyles including children and work, so I have created simple and effective three minute beauty rituals so that you can create an at home spa experience and pamper YOU. This one-day pampering experience is all about YOU. Ask hubby, family or a friend to look after the kids- put you FIRST for a change. You will walk away feeling REVITALISED, CONFIDANT & GORGEOUS. + Experience a personal step by step and hands on three minute rejuvenating skin care and radiant make up regime. + Simplify your anti-ageing skin care regime and learn about affordable skin care ingredients to assist with ageing. + Discover the latest skin care ingredients and treatments to avoid during pregnancy, breastfeeding and how to tweak your regime post baby. + Create and take home your very own divine aromatherapy pulse point elixir. The Statham family has been growing organic wine, olives and figs at "Rosnay" - their beautiful farm at Canowindra - for almost two decades. It is here that Amy sources the Olive Oil for her organic salves and body butters, therefore proving the perfect backdrop for Amy’s ‘A Country Experience’ Workshops. Establish first hand knowledge on the intricate process of rich organic produce. Sample Rosnay’s finest produce olives, figs, and wine- a cheese platter will also be provided on the day. Experience a live demonstration of how to make a salve and take home one to keep. Learn about olive oil and additional ingredients and their benefits that create a salve including essential oils, carrier oils and waxes. Access Amy’s ‘little black book’ of industry suppliers. Amy’s desire to create in-situ workshop experiences brings her to Rosnay Farm so that she can help support local farmers and offer an idealic – inspired – break for busy mothers, friends, daughters, sisters and colleagues. The Statham family has been growing organic wine, olives and figs at "Rosnay" - their beautiful farm at Canowindra - for almost two decades. It is here that Amy sources the Olive Oil for her organic salves and body butters, therefor proving the perfect backdrop for Amy’s ‘A Country Experience’ Workshops. Learn about olive oil and additional ingredients and their benefits that create a salve including essential oils, and bees wax. Access Amy’s ‘little black book’ of industry suppliers and experts, as well as a full raft of healthy DIY recipes. Signature skin&tonic naturopathic tea blend valued at $19.95. Get back to the beginning with skinCLEANSEsystem to trace the importance of skin cleansing and how you can implement a simple structure at home to ensure youthful skin and longevity of luminosity is maintained. Skin Health Workshop: What’s In It For You? You will be gifted a customised skinCLEANSEsystem collection consisting of four curated products for your current skin condition. The skinCLEANSEsystem is a family of three bespoke naturally derived skincare collections. 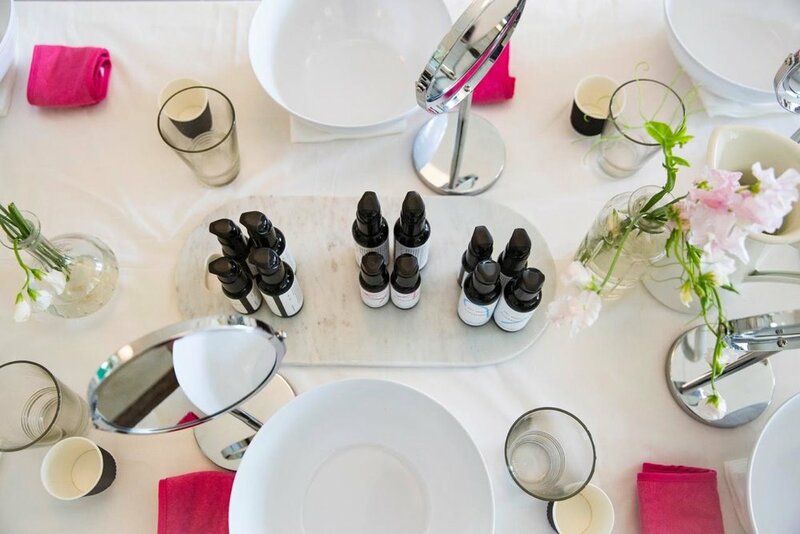 Each includes four curated products and a simple step-by-step guide Amy has prepared to educate and assist you in your skinCLEANSEsystem ritual. A thorough consultation form will be emailed to you before the workshop along with a professional skin analysis on the day. Amy will work with you to best access your current skin condition to select the best skinCLEANSEsystem collection for YOU. You will receive an e-book, brimming with simple take home tips to cater to your skins needs, in your own home. Experience and participate in demonstrations on cleansing and exfoliating all types of skin conditions as well as the most officious way to apply serums and creams to establish your own bespoke beauty ritual. You will be empowered and informed on nurturing your skin against the many environmental and ageing factors that can cause sensitivity, breakouts and dehydration. Formalise the foundations of cleansing and exfoliation fundamentals, and the benefits that they can have on slowing signs of skin ageing. Gain knowledge on the safest and most efficient cosmetic ingredients for your skin condition. You will enjoy an intimate, informative hands-on learning session with plenty of time for questions!